By Robin Darton, Senior Research Fe llow at PSSRU Kent. A pdf copy of this blog is available here. Last year I was awarded a PhD by publication (published works) in the School of Social Policy, Sociology and Social Research (SSPSSR) at the University of Kent under the special provision for members of staff of the University. I wrote the first version of this blog last year in response to a request to describe the experience for colleagues thinking about following the same route, and have prepared a slightly edited version for wider circulation, in the hope that it may also be of some interest to others thinking of pursuing a similar route. The University of Kent also offers the opportunity of submitting a thesis based on published works to external candidates, but this option is at the discretion of the individual schools of the University and is not available in the SSPSSR. I have worked in the PSSRU since 1979, and have developed an interest in housing and care for older people through a range of research projects. 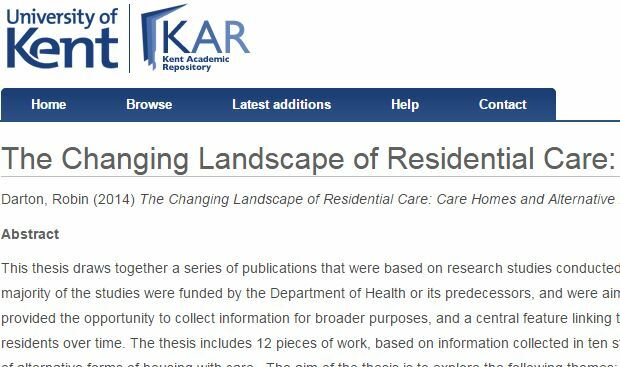 I had been exploring the possibility of completing a thesis, focusing on the role of care homes for older people, for some time prior to registering. However, the day-to-day demands of research projects, and personal circumstances, had meant that it had not been possible to find the time to devote to preparing a thesis. Changes in contractual arrangements offered the opportunity to move to a part-time contract in 2011, which gave me more scope to undertake the work. Initially, I registered for a PhD by the conventional route as a part-time candidate, for the period from September 2010 to September 2015. My supervisors were Professor Ann Netten, the Director of the PSSRU at Kent, and Professor Julia Twigg, of SSPSSR. Most of the research that I intended to draw on for the thesis had been completed when I registered, but there were a few papers in preparation that I expected to have completed during the first two years of registration. The requirement is to register for an MPhil in the first instance, and then seek upgrading to a PhD following a formal process, and after registering I enquired whether it would be possible to change to a PhD immediately, without going through the upgrading process. This change was supported by my supervisors, but the position of the University was that the normal process would have to be followed. However, the option of completing a PhD by published works was available to members of staff, and this was suggested as an alternative approach. In addition, Regulations for Research Programmes of Study, Including all revisions up to December 20144, have been produced, but these only include a brief paragraph on theses based on published works (§8.5.2). In the outline that I submitted as part of the application, I stated that the purpose of the thesis would be ‘to examine the need for and future role of care homes in the light of developments in alternative forms of care’, to address the research question: ‘Are care homes still needed?’ Following registration, I worked to expand the outline, to identify the pieces of work that were relevant to each of the topics that the thesis was intended to cover. My work in the PSSRU had covered a wider range of health and social care provision than just care homes, but it quickly became clear that the task of drawing evidence from the volume of potentially relevant material specifically on care homes would exceed the normal expectations of a PhD thesis. In addition, the collaborative nature of much of the work conducted in the PSSRU meant that many of the relevant publications were multi-authored. Apart from the other demands on my time affecting the decision on when to register, the question of identifying a topic that I could claim as reflecting my own contribution was an important issue in the discussions with my supervisors prior to registering. The University’s instructions to candidates1 state that: ‘Where a thesis is based in whole or in part on collaborative research, the extent of this collaboration must be clearly indicated in the thesis’ (§2.4). Given the nature of the reports and publications that I intended to draw upon in drafting the thesis, it became clear that the option of completing a thesis by published works might be a better option. 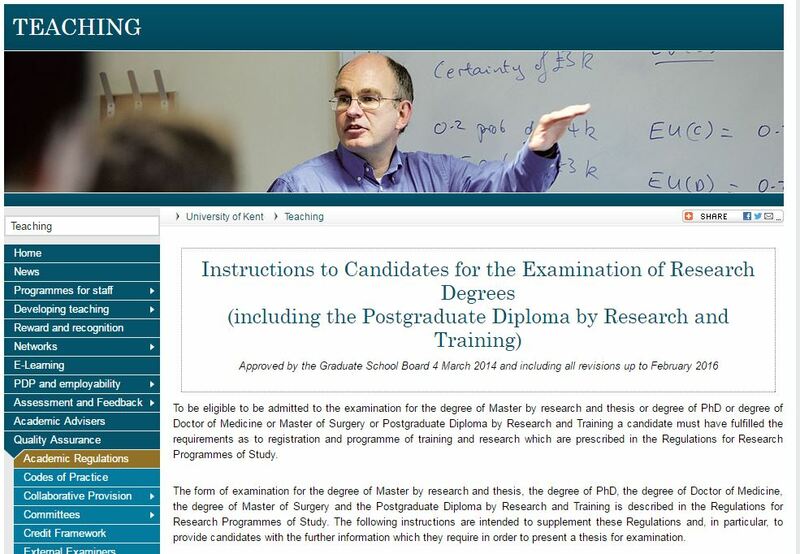 The guidance for a PhD based on published works3 states that: ‘The Degree of Doctor of Philosophy based on published works is intended for candidates who have developed their research skills to doctoral level and published extensively during the course of their careers inside or outside academia’ (§1.2). Although I still had some papers in preparation, my supervisors agreed that the published works route was appropriate in my case. Under the special provision for staff2, a member of staff who satisfies certain eligibility criteria can apply for a reduced period of registration and an adjustment to the fees payable. The reduction in the registration period is based on the expectation that candidates have already achieved a significant body of research (§4.2). 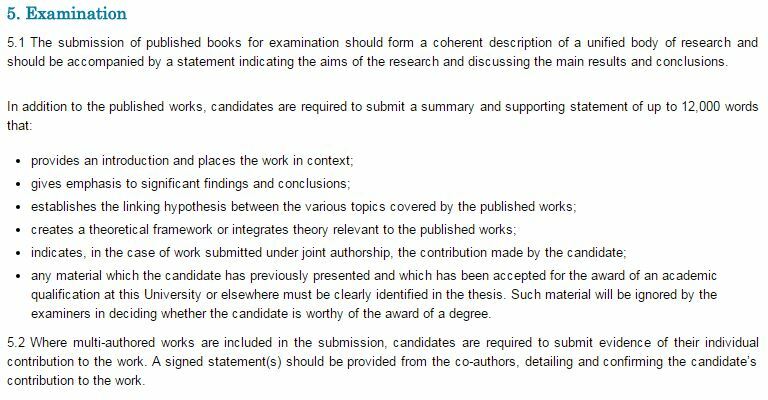 In particular, the special provision for staff applies in all cases where a member of staff wishes to submit a thesis by published works. For the published works route, the period of registration is 12 months, although there was some uncertainty about this when the possibility of changing to this route was discussed in late 2010. However, the need to complete the outstanding publications, together with the demands on my time from other projects prior to changing to a part-time contract in 2011, meant that it would not have been appropriate to apply to change registration immediately. Even when I changed from being full-time to part-time in April 2011, I had to complete several pieces of work before being able to focus on the PhD, and it was not until October 2012 that the formal application was completed. It was agreed that the period of registration would begin in 2013, with submission in March 2014, in order to avoid committing to submission by Christmas 2013. In the event, the submission date coincided with the completion of a major project and a three-month extension to June 2014 was approved. At the time I transferred to the publications route, the University introduced an on-line system for recording supervision meetings. This was helpful for recording progress, but initially it required monthly contact, which was not always appropriate for part-time study. The required frequency of contact changed to bi-monthly later in 2013, and this was much more suitable. As noted above, at the time when the transfer to the publications route was being discussed the University provided rather limited guidance about submitting a thesis based on published materials, and simply included the requirement that the candidate would have to ‘provide a statement indicating the context of the research, its main aims and a discussion of the main results or conclusions’ (e-mail correspondence, 26/11/2010). In June 2011, more detailed guidance was issued by the Graduate School, including the requirement to submit a summary and supporting statement of at least 5,000 words (and not more than 6,000 in total), and in January 2013 the maximum length of the statement was increased to 12,000 words. In relation to the issue of multi-authored works, the University’s regulations2 require that the contribution made by the candidate must be indicated in the supporting statement, and that signed statements be provided by co-authors to detail and confirm the candidate’s contribution to the work (§§5.1-5.2). It is probably easier to identify the contributions of the individual authors of multi-authored publications than it is to identify the contributions of individuals to a research project as a whole, and this may be another reason for choosing the publications route. The instructions for candidates1 set out the length of theses for the different faculties of the University, with the qualification that the maximum should not be regarded as the target length. Bibliographies, references, appendices and supplementary material are excluded from the specified maximum number of words/pages. At the time I prepared my thesis, the word limit for a written thesis in the SSPSSR was under review, and in spring 2013 it was set at 75-90,000 words, with an allowance of a maximum of 10% above this. In the earlier versions of the regulations, including those issued in January 2013, the regulations indicated that there was no minimum or maximum number of items of published work that should be submitted, and that the body of work should represent an equivalent number of words/pages to that contained in a traditional submission. However, the current regulations do not refer to the length of theses based on published works, only to the length and coverage of the summary and supporting statement. In my thesis I included 12 publications that had been published between 1984 and 2012, and for which I had been the lead or a senior author. Ten of the publications were journal articles and two were chapters in books. Three of the publications were singly-authored, five were jointly-authored and four were multiply-authored, and my name appeared first in seven of the nine multi-authored publications. In consultation with my supervisors, I selected the set of 12 publications to represent the range of relevant work, and to conform to the length requirements. The combined length of the publications was based on an approximate word count, including references, and totalled 85-90,000 words. The summary and supporting statement was just under 12,000 words. The preparation of the summary and supporting statement went through around ten drafts over the period from February 2013 to June 2014. The multi-authored works included in the thesis were based on projects with several colleagues, and a detailed description of my contribution to these publications was necessary. It would have been very difficult to write a coherent statement within the original limit of 5-6,000 words, and the increase in the maximum length to 12,000 words was very helpful. The title of the thesis did require some discussion with my supervisors, but we eventually agreed on a title that appeared to properly reflect the coverage of the thesis. For the multi-authored works, I approached my co-authors to seek their agreement for the inclusion of the publications and their agreement to provide supporting statements in May/June 2013, and all generously agreed to support my submission. I sent the relevant section of the summary and supporting statement to my co-authors in March 2014 for their agreement, so that I had plenty of time to collate their statements before submitting the thesis in June 2014. Submissions by published works are examined by one internal and two external examiners. The examiners have the discretion to require an oral examination. There was some suggestion that an oral examination would have provided the opportunity to discuss the work on which the thesis was based more generally, but the examiners decided that in my case an oral examination was not required. I was asked to add a brief explanatory note to the thesis to define ‘care homes’, but no other changes were required before the award of the degree. At the time of submission, the regulations required the candidate to prepare three bound copies of their thesis and an electronic version. For ordinary submissions two copies of the bound version and the electronic version were required to be submitted for examination, with the third bound copy being retained by the candidate. However, for submissions based on published works all three bound copies had to be deposited with the Graduate School, and no electronic version was required. The general regulations dated December 20144 refer to two bound copies together with an electronic copy for examination, and it is not clear whether this now applies to submissions by published works. Under the current regulations, successful candidates are required to submit a digital copy to the University, with the option of presenting a bound copy to the University Library. However, the inclusion of copies of published materials in my thesis raised issues of copyright, and since I submitted my thesis before the current regulations formally took effect, it was initially agreed that I would provide a bound copy of the final version rather than an electronic copy. However, after further discussions, it was agreed that I would also provide a redacted electronic version based on the summary and supporting statement for the Kent Academic Repository (https://kar.kent.ac.uk/), with links to the versions of the individual publications deposited in the Repository. In relation to the bound copy, advice from the University Copyright and Licensing Compliance Officer was that permission was not required for the inclusion of copies of the publications in the bound version, since access to this would be restricted to personal visitors to the Library, although in one case I did need to obtain permission to use a PDF file of a publication since this was originally supplied to me for my personal use. The bound copy corresponded to the version submitted for examination, with the addition of a brief note to define ‘care homes’, as noted above, and a small number of very minor corrections. The versions of the publications lodged in KAR are the final, pre-print or author versions, and permission had to be sought from the publishers in some cases, where the University did not have specific access agreements. In the case of some of the early publications, the only versions available were printed copies or electronic versions in obsolete word-processor packages, and new scanned copies or new versions in Word had to be created for deposition in KAR. Although some of the publications had been deposited in KAR already, the preparation of the outstanding versions did take some time, but this was after the thesis had been examined. In this blog I have endeavoured to describe the rather complex route that I took to achieving a PhD by published works, in the hope that it will help others considering this approach. The published works route was the right approach for me, given that I had a collection of publications that I could bring together in a coherent manner, and it would have been better if I had taken this route from the beginning, although probably I would have had to wait until I had a complete set of publications before registering. A number of colleagues have asked whether it would be possible to plan a set of publications, with the aim of developing a submission at some point in the future. However, this is likely to be difficult and, given the timescale for registration expected by the University, it would not be possible to register early, so there would be a long period of uncertainty before registering. The publications route is only suitable for a minority, and there was a feeling that I was a guinea pig for changes in the University’s regulations, somewhat complicated by the involvement of both the SSPSSR and the Graduate School. The regulations are now available on the University website, but they exist as several documents, so it is not always clear whether one has located all the relevant information. However, colleagues in the School and the Graduate School were extremely helpful in helping me to navigate through the system, and I would also like to record my thanks to my supervisors, Professor Ann Netten and Professor Julia Twigg, for all their help and advice. The culmination of the whole process was the Graduation Ceremony in Canterbury Cathedral last July. The full, bound thesis is available in the University Library5, and a redacted electronic version is available in the Kent Academic Repository6. 5Darton, R.A. (2014) The Changing Landscape of Residential Care: Care Homes and Alternative Forms of Housing with Care. PhD thesis by publication, University of Kent, Canterbury.